Network equipment and telecom equipment sales and leasing. 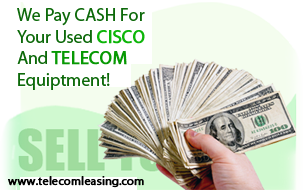 We pay Top Dollar for all Used Cisco and Data equipment. We sell and buy all Cisco, Lucent, Nortel, AFC, Juniper, Tellabs, Alcatel and all Central Office Switching and Data Equipment. We are both a stocking supplier and test facility for all VOIP products. We also offer repairs. We offer immediate results in asset recovery and liquidation service. We have unlimited resources for purchasing surplus telecom equipment upon on-site inspection. Copyright © 2010-2011 TELECOM LEASING. All Rights Reserved.